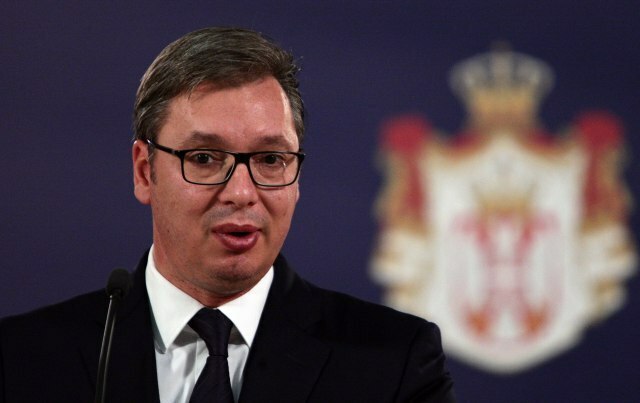 The authorities in Pristina will not abolish the 100 percent taxes against Serbian goods “as long as this isn’t demanded strongly enough by the United States”, said President Aleksandar Vucic. When asked by the reporters whether he expects Pristina to change its decision with regard to the taxes after the German parliament members visited Kosovo politicians, Vucic answered negatively. “Pristina is not interested in Germany and Europe, but only in the Americans”, he said on Tuesday. A delegation of Bundestag members visited Belgrade and Pristina this week. “Until they (U.S.) say that clear enough, they will not give up from the taxes, the president said adding that politicians in Pristina “are fighting for the voters”. “Can you imagine what would happen if we introduced measures against Croatia, Bosnia-Herzegovina or some other countries? Can you imagine me speaking of a Greater Serbia the way Rama (Edi, Albanian Prime Minister) talks of a Greater Albania? Brussels would literally hang me”, Vucic went on. With regard to EULEX’ decision to transfer its jurisdiction for war crimes against Serbs trials to the courts of Kosovo, Vucic said that he had “no hope”. “The Serbs did not have positive experiences in that sense”, he said. However, Vucic added that “we do not have too many options” because, as he said, “those who ten years ago decided to transfer the negotiations from the United Nations to the EU should have had to be aware of the consequence”. Vucic alluded to the previous government in Belgrade, when he was in opposition. “And now we have to pay a high price of the misunderstanding of the contemporary world”.